As we continue to explore the five routes to experiencing Yoga, we open up the fourth pathway to a focussed, stable mind (citta vṛtti nirodhaḥ - see YS I-2) through the door of Trust. By trusting in our true heart’s desire, we find the energy to move forward, remembering to keep on course towards that enlightened state of intuitive knowing called Yoga. Trusting our Hearts without Attaching to Outcomes Other than those who are naturally in a state of Yoga by birth, the rest of us must get there through our own efforts (pathways 1-2). Trust (śraddhā) is the motivation behind those efforts to stay on course. It helps us to practice being present and detach from anything distracting us. We must trust (śraddha) in our deepest heart’s desire without attaching to any outcomes because one never knows in life. All we can do is be true to this inner calling without worrying about what it means or how it will manifest. This trust (śraddha) will provide us with the energy (virya) to move forward and will keep reminding (smṛti) us of what our heart is truly calling for even if the desired outcome appears to be impossible. Taming the Wild Horse Mind In this Chinese New Year of the Horse, the wild horse mind can take us towards many possibilities that seem equally compelling. We need to keep on course to guide that horse towards our deepest heart’s desire. As we saw last fall, it often takes letting go (vairāgyam) of old patterns to let in (abhyāsa) new ones. It often feels safer to hold on to what we know than to step out into something new with no certain outcomes. What fuels us to make those changes? Enthusiasm – The Fuel of Transformation Where there is interest (śraddhā), there is energy (virya). This enthusiasm (from the Greek “being filled with Spirit”) helps us to remember (smṛti) where we are going and why. When that energy is lacking, ask yourself why. Maybe you are off course. Maybe there is another path which will bring you greater Joy (ānanda), inspiring you to live your life on purpose. Is it Love or Lust? 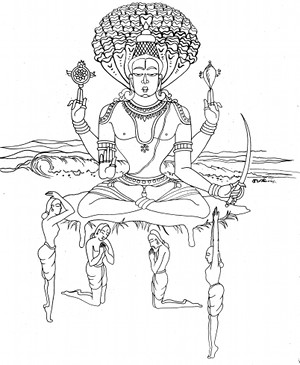 The Play of the Three Guna-s: Tamas, Rajas, and Sattva Sometimes we feel filled with apathy. We feel uninspired to get out of bed and face the tasks of our day. This is called tamas (heaviness, darkness, laziness). Other times we feel inspired to make a change, but those passions (rajas) are short lived. We fall in lust with a person or an idea, but it doesn’t last. By contrast, when we feel śraddha, we may be filled with a Love that doesn’t die. Something deep within us compels us to act. Our Hearts are running the show, and our heads are along for the ride. Nothing can stop us from reaching our heart’s true desire. This śraddha (faith, trust) is a sattvic (pure, balanced) quality of mind that naturally arises when we are centred in the Heart and grounded in the body. The first goal of Yoga is to develop this sattvic state of being, freeing us from both debilitating lethargy (tamas) and unsustainable passion (rajas) to rather enjoy a balanced, grounded, pure state of being (sattva). In this mind-body state, we find our deepest Heart’s desire. It fills us with the trust and innocence of sattvic (pure) child, who dares do exactly what she wants with great enthusiasm(śraddha) and energy (viryam), continuously remembering (smrti) to play in the truth of her being (samādhi prajña). Yoga Sutra Questions What is your Heart calling you to do right now? Do you have the energy to do it? If not, is your Heart just not into it? Are you lacking a particular direction for a fundamental reason? Is it time to change course?